In the Ashtanga Vinyasa Yoga tradition there are 6 series of postures – Primary Series, Intermediate Series and Advanced A, B, C and D. Each Ashtanga student begins by practicing the Primary Series (known as ‘yoga chikitsa’, which means yoga therapy), progressing through its set sequence of asanas (poses) one-by-one under the guidance of an experienced teacher. “Yoga, as a way of life and a philosophy, can be practiced by anyone with inclination to undertake it, for yoga belongs to humanity as a whole. It is not the property of any one group or any one individual, but can be followed by any and all, in any corner of the globe, regardless of class, creed or religion." In the Ashtanga Vinyasa system, asanas are performed in a specific order, which has the effect of ‘unlocking’ the body in an intelligent and scientific way, each pose preparing the body for ones to come. Each pose has specific health benefits for the practitioner and when combined into a flowing sequence this has the effect of realigning and detoxifying the body and the nervous system as well as developing inner strength, flexibility and improving general health and wellbeing. Although many of the earlier postures are fairly basic in terms of the flexibility and fitness required to perform, The Primary Series is considered by many to be the most demanding of all the series to learn. This is because when we come to it we are all beginners, and like any new practice it takes time and commitment to start to become easier. 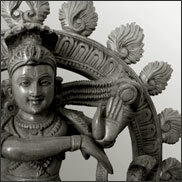 The Primary Series is also the time in our yogic journey when we have the greatest number of obstacles to overcome. Primarily these obstacles arise out of mental inflexibly; erroneous beliefs about ourselves, others and the world (or God), which inhibit our progress. Most of us will complain that it is our body’s limitations that are the problem throughout the Primary Series, but more often than not rigidity, stiffness and weakness in the body is a mirror of our limited thinking habits. Mental limitations – Flagging willpower, lack of mental focus, weak body-mind connection, negative thinking, erroneous beliefs about our lives. The therapy of yoga chikitsa is that as we progress through Primary Series, practicing the asanas we are able to with dedication and focus, both the mind and the body are softened together. So, not only does the body become stronger and healthier but our limiting thought patterns begin to shift too, making life easier and filled with limitless possibilities and joy.